Immediately upon opening my new Bradley Smoker at Christmas, my thoughts turned to do it yourself bacon. I did a little research looking for a simple, yet quality recipe. There are many options for smoking bacon. 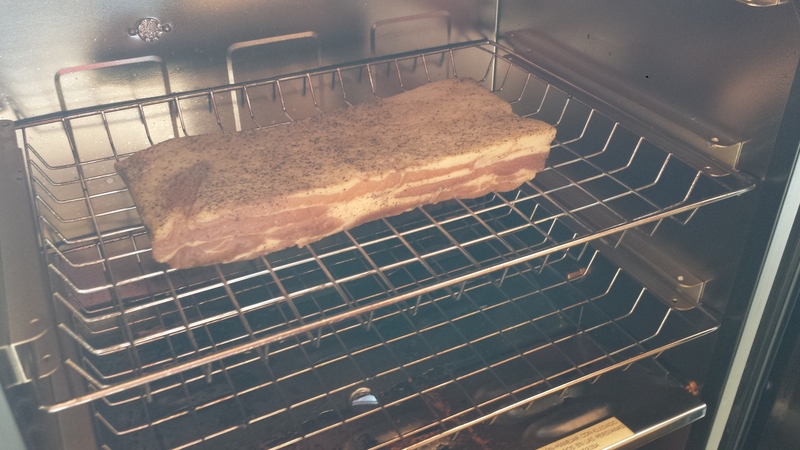 I waded through the different opinions on hot vs. cold smoking and wet vs. dry curing. After a bit of research I settled on a recipe from Amazingribs.com. I chose to go with a wet cure, hot smoke method, as it allowed for room for error in both flavor and quality of the finished product. I didn’t set out on purpose to make this a localvore project, but we are living on the high plains, and while we can’t grow a lot of things, pigs and cows grow just fine. 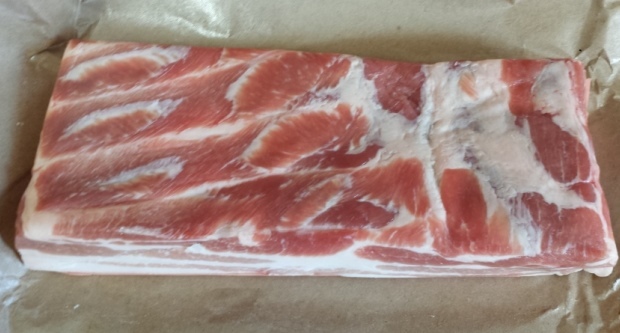 I picked out a local pork belly from Whole Foods in Fort Collins. While in Fort Collins I also picked up some curing salts at the Olde World Spice Shop on College in Old Towne. I would also use Critz Farms pure maple syrup in the cure. Now it was time to cure the bacon. I took the recipe from Amazing Ribs and made slight modifications. However, I did not stray from the salt content as that is crucial for the curing process. I mixed all of the ingredients in a gallon storage bag, and then placed the pork belly in with it. I shook and massaged it making sure good contact was made with the whole slab. I placed it in the refrigerator and each day I massaged it and flipped it until it had been curing for 7 days. I had been anticipating yesterday all week long, smoke day! Temperatures here in the front range were hovering around 30 degrees, so I was a bit worried I’d be able to keep appropriate heat in the smoker. My goal was to smoke for at least 90 minutes at 225 and then see where the temperature sat. 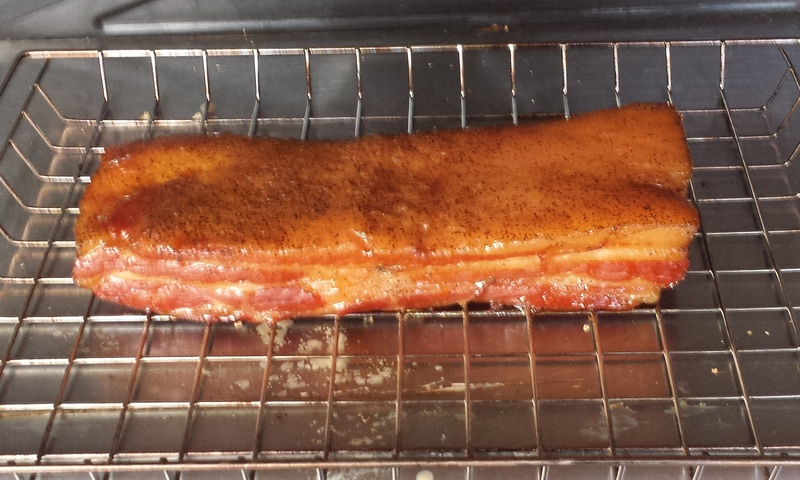 I preheated the smoker to 230 and then put the cured pork belly in. I used four bisquettes of apple wood for the smoke. The smoker maintained the temperature very well and after 90 minutes I inserted a thermometer in the meat and it read 158. I left the bacon in there until it hit 160 and then pulled it. What happened next may have been the single most flavorful experience I’ve ever created for myself. I sliced off the short ends of the pork belly while still hot and tasted them. Oh. My. God. My mouth still waters while typing the blog thinking about it. The maple, the smoke, the salt, the pork fat all combined together to produce a mouthgasam. I couldn’t resist, I had to have some of the bacon with dinner too. So I fried up some slices to share with the family. The cool thing about hot smoking this bacon is that it can be eaten cold, as internal temperature was brought to 160 degrees. You also can fry it just like a cold smoked bacon, caramelizing the fats and creating a bacon that blows away anything you can purchase in the store. Next we will start to step out of the box a little bit and I’m looking forward to cold smoking some bacon and also playing around with the recipes a little bit as well. 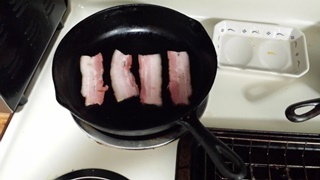 I do know that store bought bacon will never be good enough again. One staple that I make every fall is Venison Chili. It is easy to do, high in protein and fiber and on top of it all, it is delicious. I have been known to take the easy way out and use Bush’s Chili Magic beans. Recently I headed to the store on a cold September evening and could not find the beans. That made me step out of my comfort zone and start to experiment. As I was making the chili I remarked that if it was good, I may never be able to duplicate the effort because I was just throwing things in to the pot, but for the sake of this blog, I’ll try to recreate what I did. I started by heating a cast iron skillet to medium high and browning the ground venison one pound at a time. In a medium stock pot over medium heat I added the three cans of beans (rinsing the kidney beans, but using the sauce in the chili beans), the four cans of diced tomatoes, the garlic and chile peppers. As each pound of ground venison was finished browning, I added it to the stock pot. After the final pound was added to the stock pot I deglazed the pan with about 1/3 of the bottle of Sam Adams, and scraped all of the brown bits and beer into the stock pot. I then browned the onion, once again adding 1/3 of the bottle of Sam Adams to deglaze the pan and finish cooking the onions. The last 1/3 of a bottle was dumped straight into the chili. I then let the chili simmer for about two hours. After tasting it, I salted it some more and threw a little bit of garlic powder in it. I served it with shredded Mexican cheese and sour cream. This came out very good, and I brought it to work and to fight night where it received good reviews at each. It had just the right amount of heat to it, while maintaining flavor. I’ll certainly try to stick to this recipe of close anyhow the next batch I make.